Skiers, here is your chance to support the very trails you enjoy so much. 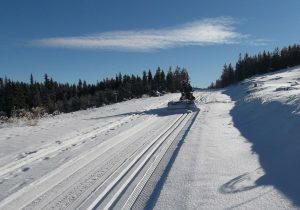 Where else can you cross-country ski on such an extensive network of trails so close to home? The non-profit GBCTA uses both contractors and volunteers to keep those trails in pristine condition. Your contribution is vital, so please give generously. Click here to donate online (please select Ski Trail Grooming from the drop down list and / or mention 50/50 in the comments). Or you can send a cheque (made out to GBCTA) to Box 1379, Bragg Creek, AB, T0L0K0. Or donate with cash deposited at one of the three secure donation boxes in the West Bragg parking lot. Grooming Operations to Resume!! – Notice from Alberta Parks that GBCTA has approval (as of December 1) to groom both ski trails for skiing and all season trails for fat biking.